Experience Mallorca in a different way! The open-air experience of a special kind! Guided TRIKE TOURS (5-6 trikes) through the fantastic landscape of Majorca. Enjoy fantastic views, combined with loads of fun. The holiday highlight for drivers and co-drivers. 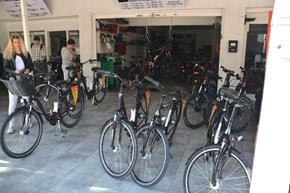 Would you like to explore Playa de Palma by bicycle or eBike? Then book with us your two-wheeler at the best price. You already know our great service and want to make a reservation now?